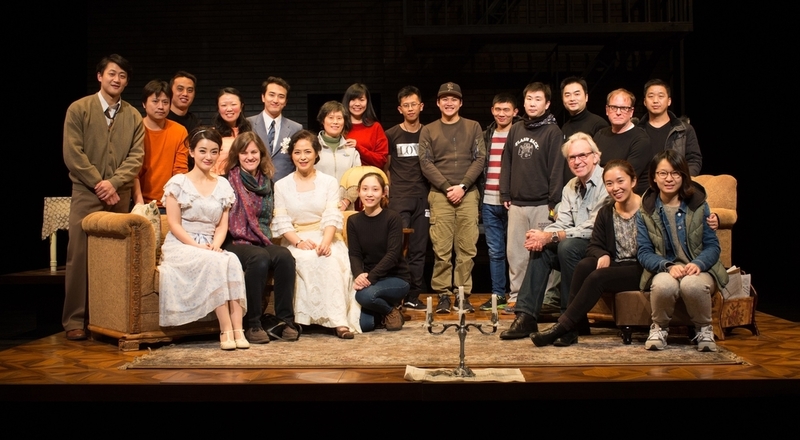 Pictures of the The Glass Menagerie in process at Shanghai Dramatic Arts Centre this past winter. This experience was a re-affirmation of my love of making theatre. I am so grateful to the artists of this company for the invitation to create this production with them. View from the wonderful lace store Outai Accessories in Shanghai, where you could find anything. Wished I could have shown it to some costumer friends that day! Treasures packed from floor to ceiling. And they would dye it for you! The sweet, patient Zongzong leading the search for fabrics. Massive fabric store with three floors of individual vendors! One vendor's booth in the warehouse where you went for trim. Lena got us these fantastic warm, sweet tea drinks with little beans in the bottom and tons of milk. One of many things I miss about Shanghai! Our intrepid producer Lena finding a candelabra in an antique/ junk shop way out in Pudong. This day was an adventure I can tell you more about in person, but it involved the two of us getting into a filthy van with a guy from the store, which had changed locations. When we got there, we dug through deep dust for the needed props, hence the triumph! Zongzong tries on the cloche with appreciation from Ping.